ear not true-believers. I haven’t gone away. Superbaby #3 is supposed to be here any time [[now]], and his impending arrival has taken up all the bandwidth around here. Unfortunately all unnecessary activities have been put on hold: personal hygiene, putting gas in the car, taking out the garbage, feeding the pets… and unfortunately, blogging. As I’ve said before, blogging takes a certain amount of energy and free time… both of which are incredibly scarce around here. Instead we are setting up pack-and-play’s, finding all the old boy baby clothes in the attic, washing them, folding them, getting registered at the hospital, and setting up a squishy, newborn-baby photo shoot with an absolutely ROCKIN’ photographer (happy to provide referrals). 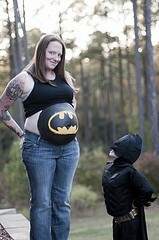 Safe to say Un-DorkMommy won't ever be taking a picture like this. Even now my daughter is dragging me away to go play “cash register”. In all seriousness, Superbaby #3 is due any second. We’re all on pins and needles around here. I’ll check back in after the dust settles. Stay tuned. I can’t wait to meet him! 🙂 Enjoy the dust with two while you still can my friend!